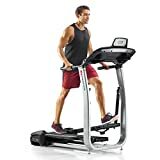 The stability of a treadmill, the intensity of a stair climber, and the versatility of an elliptical – this is the package you get with the treadclimber. This unique machine offers an effective, low-impact workout that balances the perks of other exercise equipment. In this piece, we’ll run through everything you need to know about the best treadclimbers you can buy today. The best, most extensive set of smart features makes this an option that’s intelligent, well-built, and truly top of the line. An impressive set of features for an affordable baseline model that comes with the Bowflex build quality. A user-friendly, commercial model. Comes with nice user features like preloaded workout programs and a dedicated heart rate display, but the price is steep. Integrated Bluetooth connectivity gives you automatic syncing with popular fitness apps, user profiles to keep track of individual stats, and an intuitive heart rate monitor to stay on top of your cardio. Slightly faster than the TC100. An interactive, backlit LCD panel keeps track of basic stats like speed, distance, time, and calories while the built-in heart monitor logs BPMs mid-workout. An onboard USB charger keeps your devices charged and running. A design with the user in mind, the E-TC includes perks like a scrolling message window. There’s also plenty of room for your accessories with a large tray and multiple cup holders. The price is a considerable jump over the TC100. This may be a detractor if you’re looking for a value and don’t want the expanded feature set. The feature set falls short of the TC200, specifically with the lack of Bluetooth connectivity and other smart capabilities. This is a commercial model and has the price to match. Price point may be unjustifiable for a home model, but has the potential to be a fantastic long-term investment for any gym. Many health benefits. These machines engage every major muscle group in your legs and offer an efficient slow calorie burn through cardiovascular work. Additionally, they can help your balance, coordination, and walking form. The best of three worlds. Treadclimbers include the treads of a treadmill, the steppers of an incline trainer, and the overall motion of an elliptical. This offers a low-impact exercise that, while limited to slower speeds, still provides a good workout challenge. Adjustability. Treadclimbers are easily adjustable to accommodate different stride lengths and body sizes. 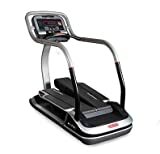 They also have the ability to operate as a pure treadmill or incline trainer when you lock the treads/steppers into place for a more stable and traditional workout. Treadclimbers are a relatively new, brand-specific product, so pricing and models are limited. $1799: The price of the TC100. Comes with certain high-end features like a USB charging port, heart rate monitor, and backlit LCD display, but lacks others like apps and connectivity. $2499: The TC200’s price for all of the super high-end features like MyFitnessPal, Apple Health, and Google Fit integration and a more intuitive heart rate monitor. $12,000: Soaring above the rest, the price of the E-TC will certainly make you do a double take. A fancy name for the main tread steppers of the machine. They respond to downward pressure, and the design forces each foot to step and stride at the same time, creating an elliptical path. The heart and soul of the machine, the console tracks speed, distance, time, and calories. The consoles of both models can keep track of data for multiple users and include preset workouts. These features become even more expansive if you opt for a treadclimber with Bluetooth/WiFi connectivity. 100- and 200- level treadclimbers come with heart monitors. A higher-end console will add connectivity for wireless sensors. Other common accessories include bottle holders, tablet stands, charging ports, and transport wheels. Limitations: Treadclimbers aren’t built to be intense, HIIT-style training machines. Instead, they focus on a slow, efficient calorie burn, akin to that of a hike. This can be great if you’re looking for that type of workout but may be a limitation if you want a higher intensity. Additionally, the design of the treadles may be tricky if you have balance issues. Model choice: While treadclimbers are (pretty much) specific to Bowflex, it’s still important to choose the model best fit for you. The TC100 features shorter treadles and more basic, home/casual-oriented features, while the TC200 is the more advanced model with longer treadles, expanded tracking, and a slightly higher speed. Space: A treadclimber’s footprint is no larger than a traditional treadmill or elliptical. Set aside around 50”x25” of space. Bowflex’s top-of-the-line treadclimber is our best overall pick due to the greater feature set over the TC100. Like a lot of higher-end fitness machines, one of the main appeals of the TC200 is its integrated Bluetooth connectivity. This allows the machine to sync your data with popular apps like MyFitnessPal, Apple Health, and Google Fit. The TC200 also allows you to create up to four different user profiles for use with the whole family. Embrace the more intuitive multi-zone heart rate monitor if you really want to maximize your workout performance. All of these extra features come with a greater price tag. Ultimately, only you can decide if the $700 jump is worth it. If you’re someone who enjoys web-based fitness tracking or has a larger number of people who will use the machine, the cost may be worth it! This baseline treadclimber comes with a solid set of features and quality construction. Lacking the connectivity of the TC200, you can still keep your playlists and workouts pumping with the built-in USB charger, all while enjoying the quality of a Bowflex. An interactive backlit LCD display keeps track of your speed, distance, time, and calories. Grab the contact grips on the sides for an accurate heart rate reading while cruising at walking speeds of up to 4 MPH. Obviously, you won’t get access to the digital world of fitness tracking with this option. If you don’t track fitness progress on your phone, however, and connectivity isn’t important, this won’t matter. A Bowflex alternative that could be a great investment for commercial use, but prices itself out of the home market. The E-TC’s unique design makes it super user-friendly. An easy-to-navigate display features a scrolling message window, preloaded workout programs, and a dedicated heart rate display. There’s a ton of room to store all your stuff in multiple cup holders and a large accessory rack. The main drawback is the high price point, but again, this is a commercial model. While it’s not terribly justifiable for home use, this model could be right at home in a commercial gym or common exercise area. Start slow to get used to the two-track treadles and walking style of a treadclimber. Always warm up and cool down before and after the core of your workouts. While this machine may not be designed for HIIT, alternating between low and high speeds can increase calorie burn. Q: Can I run on a treadclimber? A: No. Treadclimbers limit the pace to walking-speeds of around 4.5 MPH. The exercise is similar to a hike. Q: How complicated is assembly? A: The good news is you likely won’t have to worry about it! Bowflex offers free expert assembly on both the TC100 and TC200, which will save you a lot of time and energy. Consult your owner’s manual if you want the assembly challenge for yourself. Q: How noisy are treadclimbers? A: Due to their slower, low-impact workout style, treadclimbers can be very quiet, especially compared with traditional treadmills. 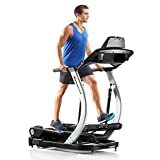 Q: Do treadclimbers fold up? A: Unfortunately, due to the design of these machines, treadclimbers don’t have a folding frame. They do, however, use a compact design and transport wheels for moving it around the home. Treadclimbers offer unique workouts that bring a little bit of something from the most popular cardio machines. What they lack in speed or intensity, they make up for in efficiency with every step. Overall, the Bowflex TC200 is the best option because of its superior set of features. The TC100 is still a great pick if you’re more casual or don’t need certain higher-end features. Ever used a treadclimber? Are they a part of your workout routine? Let us know down below!